This amulet was stolen out of the ancient East its used in Hinduism and later Buddhism when it was created. There is a lot of nonsense claiming what this is in kabala. In Hinduism the most important mantra of Kundalini Yoga is that of Shiva and Shakti which is the Ham (Shiva) and SA (Shakti) mantra. This is used as part of a prana Kriya to open the centers in the brain. However in Kabala the symbol of the open hand is the crown chakra and the all seeing eye is the pineal gland or as they call this the Eye of God. The full and proper spelling of this mantra in the ancient Hindu texts is Haum Saum. Haum is the bija mantra of Shiva and placed in the crown as mentioned in the previous article on this subject. And Saum is the bija mantra of Soma the moon deity the sixth chakra. 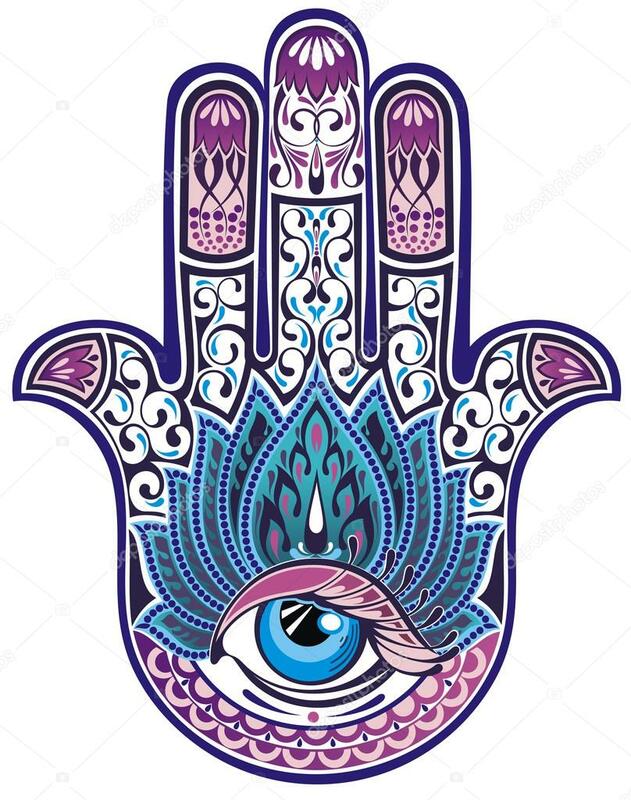 The five fingers of the Hamsa hand in Hinduism and Buddhism represent the five elements which come together in the Third Eye. This amulet stolen from ancient Hinduism is the formula for opening the crown chakra and third eye and how they interconnect. And its the name of Shiva and Shakti. Its not even Hebrew. Its Sanskrit. In Kabala they call the highest God the Ayin which is the 16th letter in Hebrew and means "Eye". And in Kabala is simply the term for the All Seeing Eye. In Kabala it states when Yahweh states his name is: "I' am what I am." This is Kabbalistic: Ayin, Yahweh is AYIN. Ayin is the "Eye of God" and the pineal gland in Kabala. This is also stolen from Hinduism from Ain which is the bija mantra of the Goddess Saraswati. Its Ain not Aim it has the symbol of the nasal N sound not the M in Sanskrit. The AIN mantra is given for the Sri Yantra which is the yantra of the Moon Chakra the All Seeing Eye. The AYIN the Y is a double letter with I in Kabala so its redundant. The number of 130 for the full spelling for Ayin is based on five times twenty six. The Five elements and the number of their "god" that of twenty six. In Kabala which is the pure understanding of the Torah and Judaism they state their "god" is simply the energy of the letters and the All Seeing Eye. The chakra point in the head. Which is a concept they stole from the ancient religions such as Hinduism and Egypt. The head God of Egypt: Osiris was called "The Eye" the Ayin. This is the Eye of Shiva in the east.